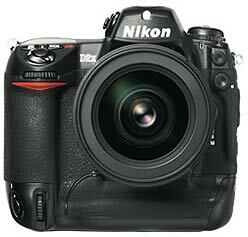 Nikon D2x Review is posted on DpReview. This is quite fast I must say, as I didn’t expect it yet. Phil has definately put some extra efford in it to get it there on time. The 30 page review covers a lot like we used to expect. The camera is a bit lighter then the Eos 1Ds Mark II and has a bit better ergonomics. Th emeasured throughput on Sanisk Extreme II card is almost 10mb/s — as fast as you would get with a Cardbus adapter. Some tests wit the RAW convertors show that Nikon Capture is not pu to par with Adobe Photoshop CS and Bibble Pro. Nikon Capture takes 15 seconds to write a JPEG compared to 3 seconds for Adobe and8 seconds for Bibble. Also memory consumption goes upto 1GB. Further is the camera compared with the EOS 1Ds Mark II in noise performance and sharpness. In the end the Canon offers more resolution with its 4mpix additional image information (2800lines vs 2400lines). I prefer the new Nikon coolpix S2 that is recently announced! Nikon has announced a collaboration with Microsoft which will allow easy access to its raw NEF files in current and future versions of Windows. The project is intended to make NEF more widely accessible through current and future versions of Windows, which is ironic considering that just a few weeks ago it emerged that Nikon had encrypted white balance data in its NEF files which meant it could not be read by Adobe Camera RAW. The next version of Windows, Longhorn, will offer enhanced native support. Microsoft and Nikon have previously worked together producing Microsoft's RAW Image Thumbnailer and Viewer for Windows XP.